Google+ holds a king like reputation in the search engine optimization. While SEO is very important for small businesses because of the low cost and superb potential impact. But are the Google and Google+ really a supportive hand for small businesses or causing the harmful situations to destroy them. In this article, we are going to discuss both the facts and find out what practices should be followed or not for getting best out of Google+. As the prime advantage, Google plus hangouts are the providers of high practical business values. The video conferencing feature helps in arranging the video discussion for up to 10 people at the time. It also helps the businesses to find new markets and promote their products and services. For the businesses associated with IT industry or technology market, this leading social media tool appears as the great opportunity to get connected with the real customers. One can easily identify and share the specifications, information, and messages to the target audiences. The other criteria where Google+ provides the supreme ease and convenience is networking. Google+ effectively increases the networking capabilities. While someone pays attention to the Google+ profiles, he or she will able to get deep and detailed information about various contacts and potential customers. This can be a nice ground for some significant future dealings. Still today, many business owners don’t take it seriously to spending a good time on Google + or any other platform of the same niche, so you have a nice chance to connect more and more people, establishing healthy relationships with them and cultivating better results than your competitors. Though Google+ is empowered by Google itself, it is not reaching to larger online communities as its competitors do, for example, Twitter and Facebook. So, obviously many potential customers are still out of Google+’s reach. It is also possible that the potential customers will not show any interest in the company’s Google+ profile as they don’t want to use this platform. A small-scale business cannot afford this avoidance. UnfortunatelyGoogle+ has a poor social media track record, this factor increases the risk of unfavorable return on the input of time and efforts in the promotion campaign. Of course, there are some limitations with Google+, still, it can play a great role in the success of a small business. Here are some should be and should not to be taken a step while using Google+. The biggest advantage of Using Google+ profile is that it has the powerful backhand support from Google. So while using Google+, a business simply comes into an advantageous position to exploit its SEO value. A small-scale business can easily rise to the top during location-based searches. So combine Google+ business page and Google + local page and enjoy the results. Adding images of your business headquarters, factory, and staff along with your products on your Google+ profile is an effective method of influencing the user to stay on the page. These images will also be subjected to Google’s search pages if there are location-based queries in searches. If you manage to develop and implement a fine strategy for content sharing on Google+, you will surely get a sufficient traffic on your site. As the most working trick, post the smart content with proper links to get comments or get connected. No need to add that the content must be effective and interesting with relative uniqueness. An impressive post with a nice presentation and use of suitable pictures can make a big difference. With the use of # in your blog post, there will simply increase the likelihood the searches will find your posting easily. You need to work hard to gain a large group of a follower. Add more people to your circle ad ask them to do so. With this huge number of followers, your claim for an authoritative position on Google search engine will also be strong and it will ultimately improve your search ranking. Apply this less used feature of Google+ for developing connections with the people of the industry, potential clients, strategical partners. The main aim of creating a community of the people of the same niche is to discuss the common issues, make efforts to understand the mood of the market, find the new solutions to the problems and most importantly reach to a rather new group of potential clients. You should ask reviews from your audiences and customers by offering your Google+ link. This is an effective way to build your business’s credibility and make you stand out from your competitors. The reader’s reviews also help in understanding the customer’s reactions, expectations, and complaints, and offers a ground to solve them. It is very important to set or claim your business page. While you are operating a local type business, necessarily verify your address. Furthermore, look to link up your website and combine a “follower button” to your site. Now, the next thing you need to do is adding a content to your profile. You need to regularly update your profile with all of the important and detailed information, notifications, and images that may be a support to build trust and relationship with the customers so they may be influenced to start interacting with you. Unlike Facebook, Google+ is wide open for interaction with followers. This platform empowers you to proactively reach out to your customers. You can offer them discounts, coupons or just use them for building relationships with your customers. So don’t just wait for your customers to come; go ahead and be the first to start a conversation. Always avoid the over posting as it will simply annoy your customers. Google has the most efficient anti-spam system so any defaulter can be easily blacklisted or suspended. One should not mix up or confuse the various Google pages with each other. The Service Area, Store Front Page are quite different pages with different utility and applicability. So while applying them, one should use proper understanding and consciousness. 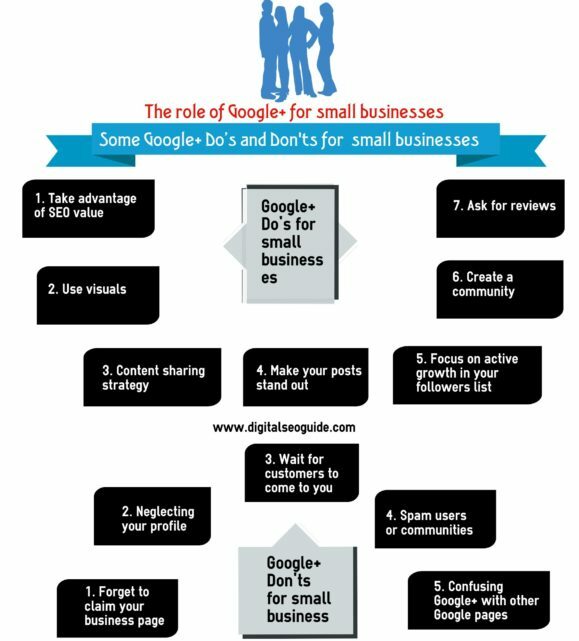 Well, I’ve described some pros and cons of google plus for small businesses.These googles+ do’s and dont’s are not just steady in getting good results for your small businesses, additionally, help you to reach potential customer for your business. Let us know if you have questions or recommendations.